Prof. Dr.-Ing. Peter Plapper was born in Mannheim, Germany on September 16th 1963. In 1986 he completed his studies on Mechanical Engineering / Design at TU Kaiserslautern with the degree Dipl.-Ing. His doctoral thesis at the laboratory of tool machines (WZL) of RWTH Aachen, Germany was awarded with the Borchers Medal for scientific excellence in 1993. Since 1994, he worked for Adam Opel and General Motors in different management positions in Manufacturing Engineering (ME) with increasing responsibility. He developed innovative production technologies, implemented tool machines and coordinated the refurbishment of robotic assembly lines. From 1998 until 2002 he joined the Tech Center of GM in Michigan, USA where he shaped the global manufacturing strategy for Body Shop and General Assembly. During his industrial career he worked on many different robot applications, led the installation of assembly lines all European GM vehicle plants and was responsible as HEAD of MANUFACTURING Engineering for the equipment of all shops in plant Russelsheim. 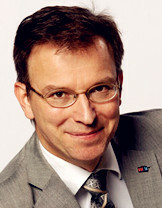 Following his assignment as MANAGER ADVANCED TECHNOLOGIES EUROPE Peter Plapper was appointed in 2010 FULL-PROFESSOR for manufacturing engineering to the University of Luxembourg.